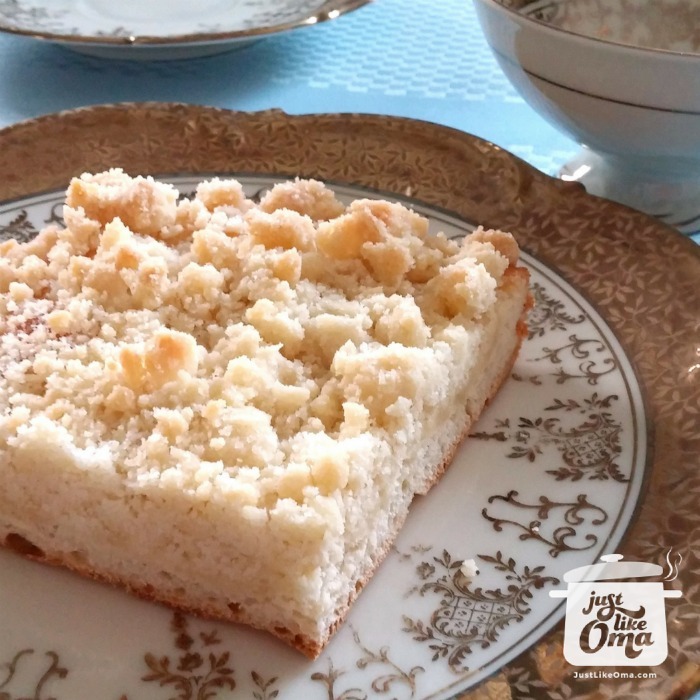 This Butter Cake recipe, aka Butterkuchen or Zuckerkuchen, is a traditional German cake often served for afternoon coffee. 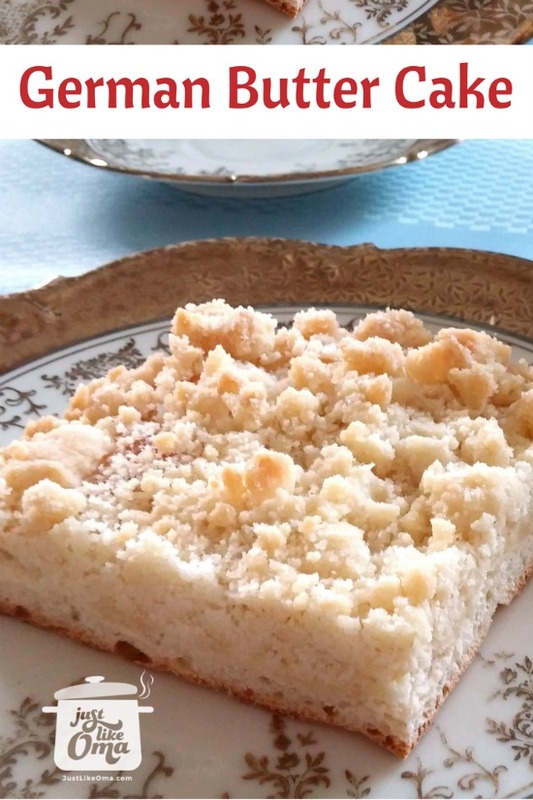 In the photo above, this butter cake is topped with streusel. Popular as well is when it's covered just with butter, almonds, and sugar. You can also include cinnamon, and/or sour cream in the topping giving a completely different cake. Want something faster? I've included a link at the bottom for a butter cake recipe that uses a bread machine. Faster. Easier. Just as delicious! Mix in 1 cup milk, oil, egg, and ½ cup sugar. Beat in 2 cups flour and mix well. Let stand 10 minutes. Add more flour until a soft dough results. Remove from bowl and knead until smooth and elastic, adding flour ONLY if necessary if it is too sticky. Put dough into a greased bowl. Cover and put in a draft-free warm place for about 30 - 60 minutes, until it has doubled in size. Grease a 15" x 10" jelly-roll pan. Roll out dough to fit pan and place in pan. Make small hollows in the surface of the dough with your fingers. Brush dough with ½ cup milk or cream. Cut butter into small pieces and place in hollows. Sprinkle ⅔ cup sugar and nuts over dough. Cover and let stand in a warm draft-free place for about 30 minutes. Preheat oven to 400° F. Bake for 20 to 25 minutes until golden brown. Let cool slightly and cut into 20 pieces. Change this basic butter cake recipe by adding 1 tsp cinnamon to the ⅔ cup sugar before sprinkling on top of dough. Omit nuts if desired or use hazelnuts instead of the almonds. Add little dollops of sour cream over top, using about ½ cup, before baking. Or make a streusel topping (as shown above) by mixing together 2 cups all-purpose flour, 1 cup sugar, and 1 cup butter into a crumbly mixture. Spread on top of dough instead of sprinkling the sugar and nuts over the dough. Haven't used yeast before and are hesitant to make this butter cake recipe? It's not that hard. Follow these tips and you may just find yourself making cakes using yeast quite often. This is a recipe you'll get your hands into ... it's fun to knead! Don't use ingredients that are hot or cold. Ideally, everything should be at room temperature. The heat can kill the yeast and the cold can hinder the growth of the yeast cells. Check expiry date on yeast package. Do NOT use old yeast. It will not rise! You need to count in time for the yeast dough to rise when calculating how long from starting the cake to serving time. It's a quick cake to make, just takes time to rise. When letting the dough or cake rise (often both need to rise - just check your recipe), do so in a warm, draft-free area. A great place can be your oven. Often I'll briefly turn it on and then off - just enough to take the chill out (you should be able to easily touch the inside). Then put covered dough/cake in and close the door. Warm and draft-free. Remember to take it out before turning the oven on to bake it! The yeast dough is a basic cake yeast dough that can be used in many different recipes economically yet absolutely delicious! 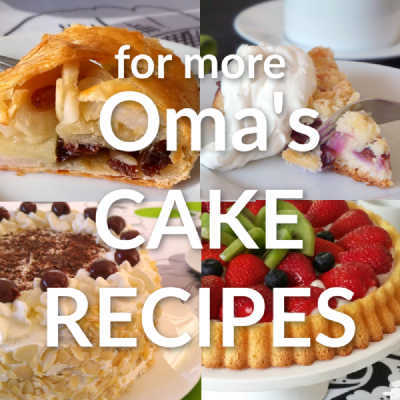 It's among the best quick and easy cake recipes for that reason. Do you have a bread machine? You do? Then, you can make this quick cake ever quicker. If you're looking for a really, really easy version of this cake, one that uses a bread machine to make the dough, then check out this German Butter Cake. As with anything made with yeast, this tastes best served the same day it is made. Served still slightly warm from the oven with a bit of whipped cream, it is absolutely YUMMY! "Give freely and become more wealthy; be stingy and lose everything. The generous will prosper; those who refresh others will themselves be refreshed." This Butterkuchen, also called Sugar Cake (Zuckerkuchen), a traditional German cake served for afternoon coffee. Loved by all, easy to make, delicious to eat!